I’ve recently bought myself an Arduino Uno R3 kit and I’ve built myself some simple projects to get a feeling of what is possible with this stuff! Having little to none experience with microcontrollers I must say the Arduino is quite simple to get into, and the community is awesome with ALOT of tutorials and questions answered online! Much like the Unity community! 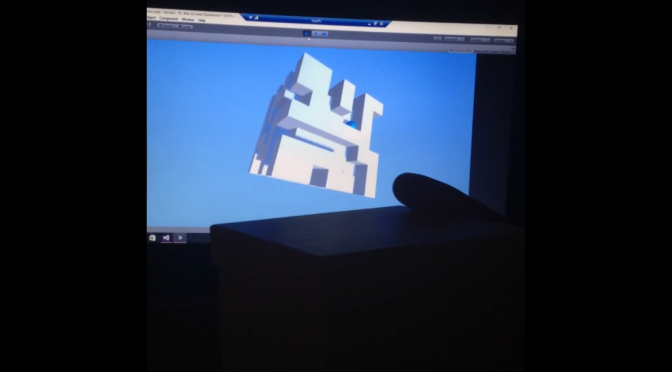 One of my first projects was to try to get the arduino to communicate with Unity! My plan was to make a gyro-accelerometer for use with my computer! For this I paired the Arduino with a Wifi-Shield(ESP8266) and a GY-521(MPU6050) 6DOF gyro/accelerometer. I set the esp8266 to be a client, hooked up to my computer as the server. I used a free library for handeling the gyroscope which converts the gyro/accel raw data to quaternion rotation and sends it as a string on the serial line. The ESP8266 transmits the string over TCP to the server. In Unity i set up a TCPListener on a seperate Thread that continuesly reads the strings from the Arduino and converts string back to quaternion rotation. The setup is not very accurate so not very useful, but fun project to get working! Now I’ve started working on something else! Bigger, better and more beautiful!